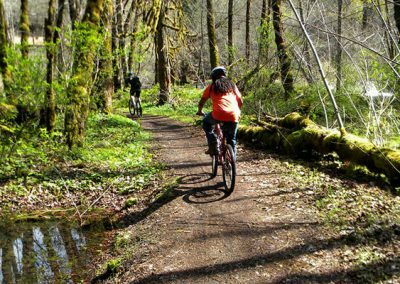 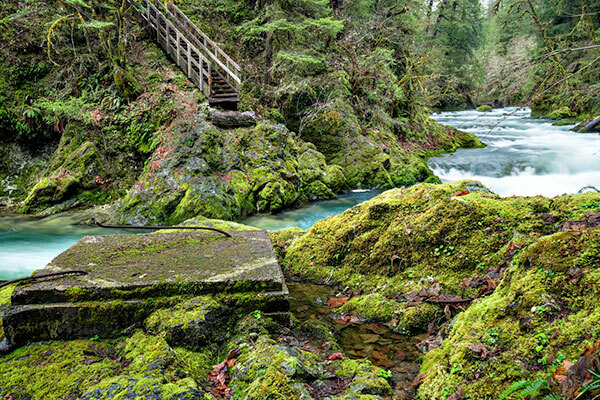 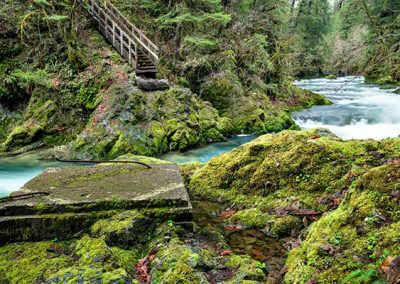 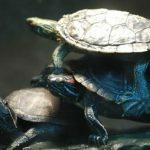 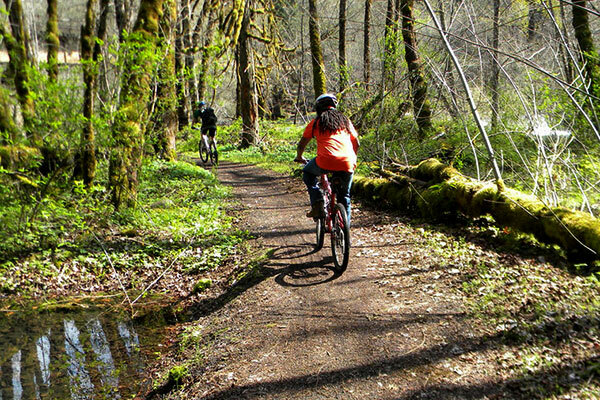 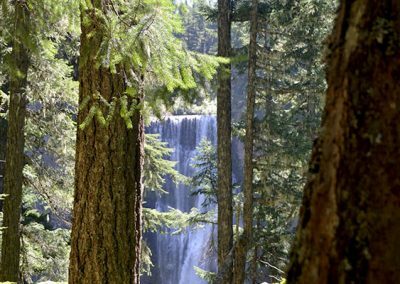 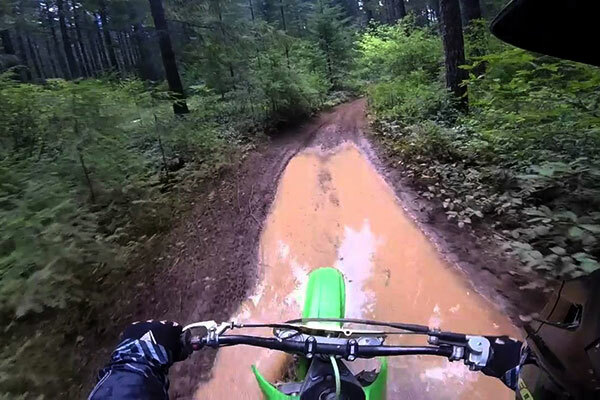 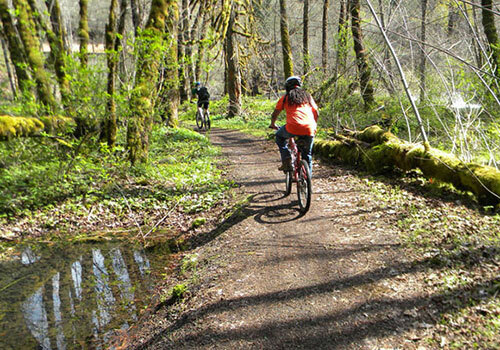 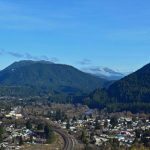 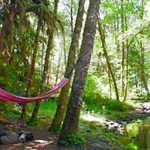 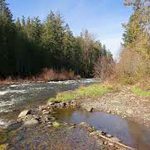 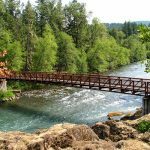 Actually, there is a lot more to do than mountain biking and hiking in the Westfir-Oakridge Oregon area. 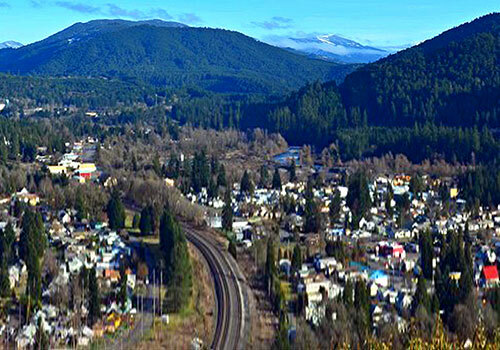 The towns are surrounded on all sides by the Willamette National Forest. 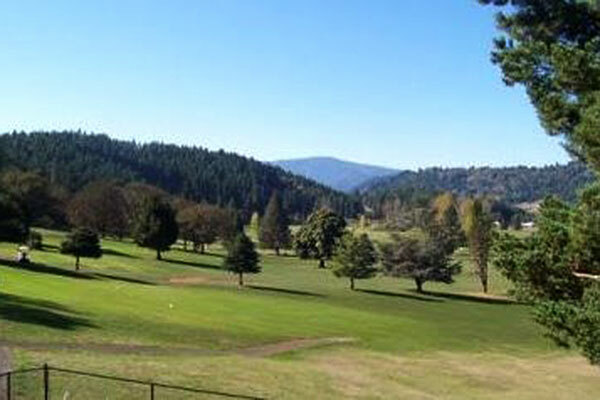 The 18+ acres of TDR is bordered on two sides by the Willamette National Forest, the other side is bordered by Gray Creek. 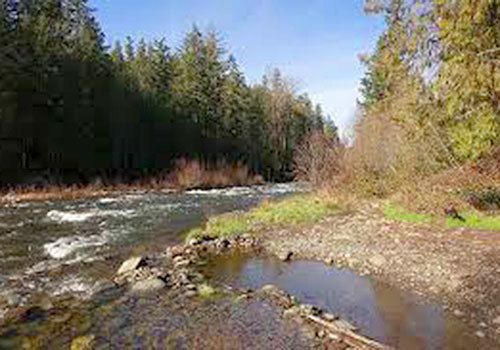 We are the last property on this county road. 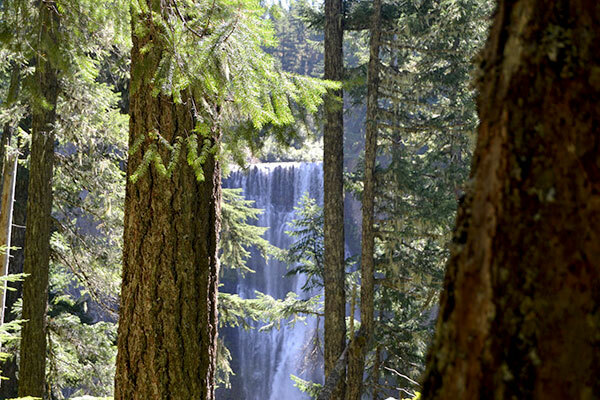 So you get the picture that we have a very natural setting. 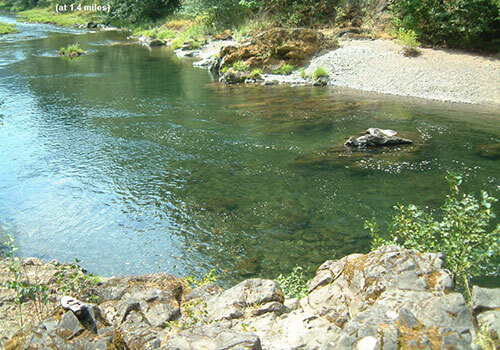 If you like outdoor recreation, there is a lot to do in this area. 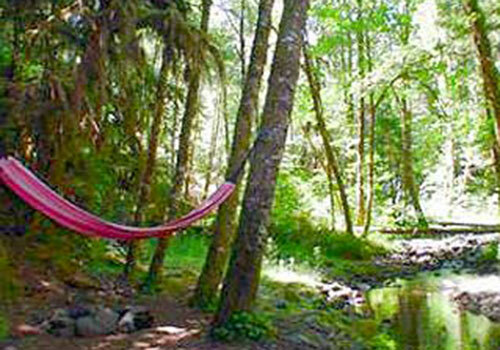 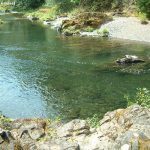 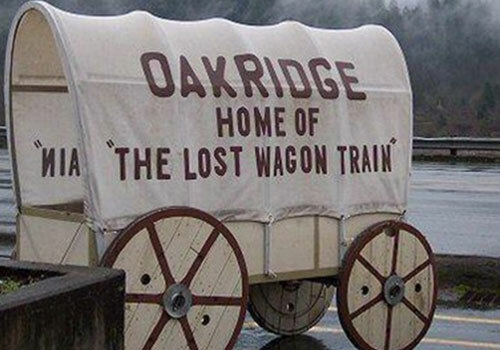 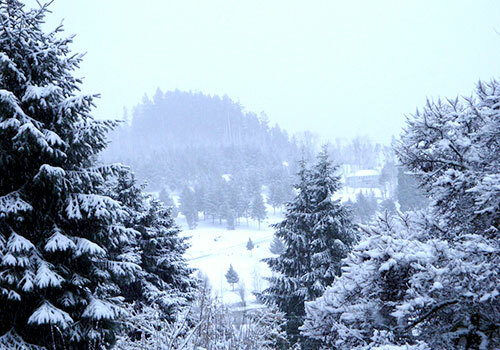 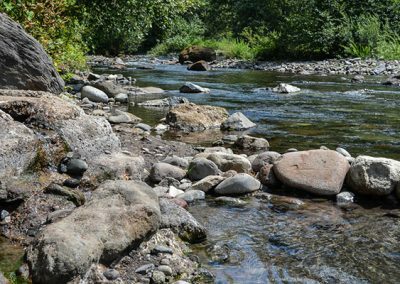 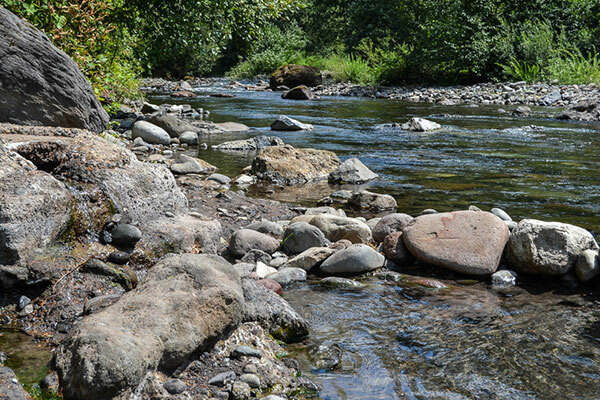 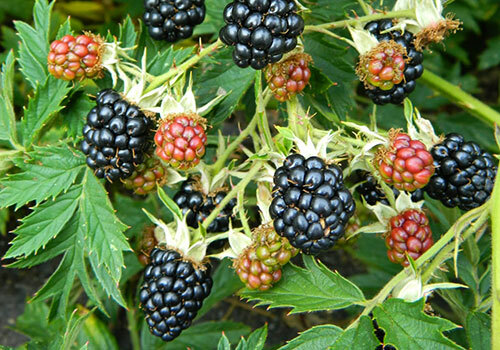 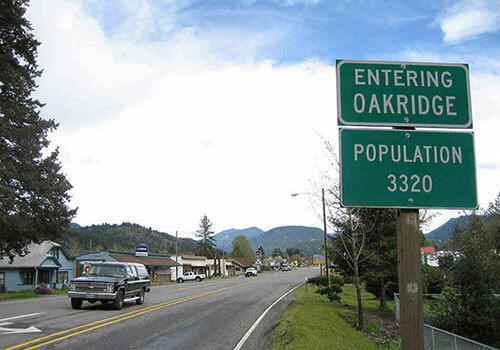 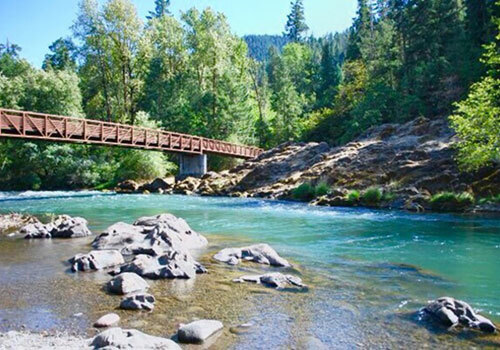 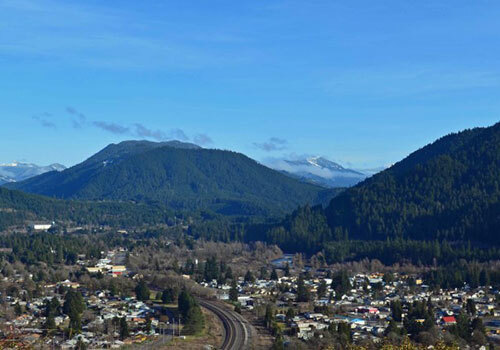 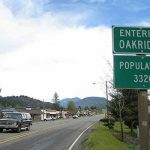 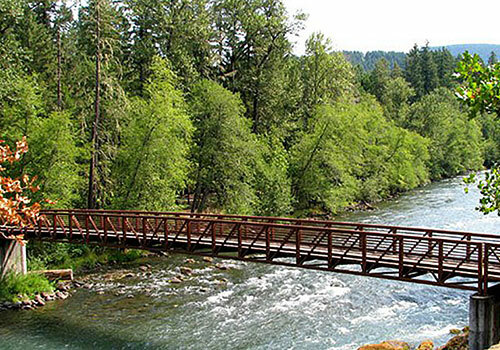 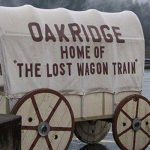 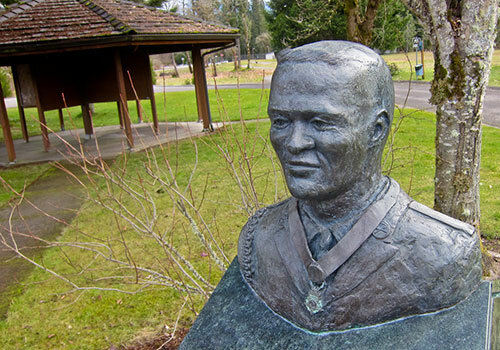 Click on a link below to learn more about activities near Westfir-Oakridge Oregon. 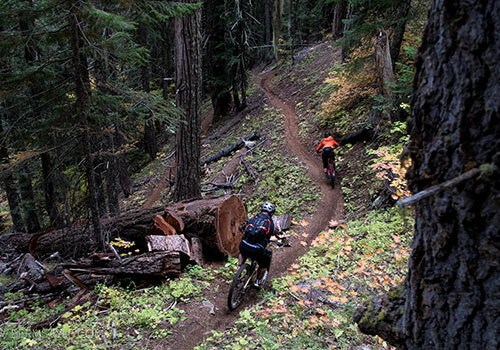 Oakridge touts itself as the Mountain Biking Capital of the World. 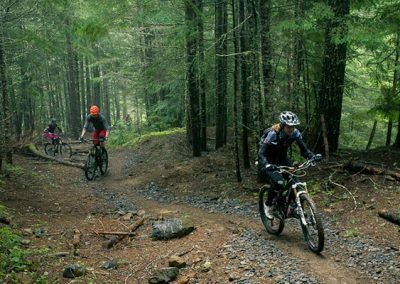 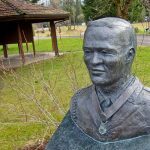 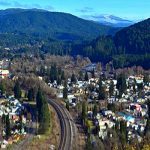 Although we are sure there may be other towns that do the same, it is true that mountain bikers enjoy the many trails of varying difficulty in the Oakridge and Westfir Oregon area. 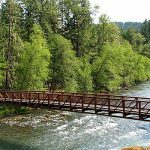 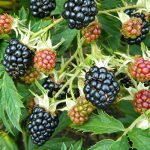 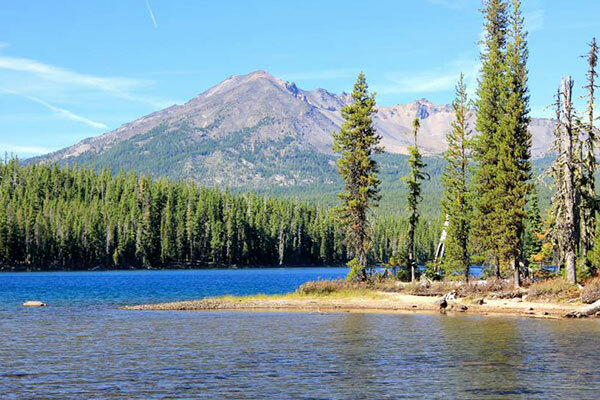 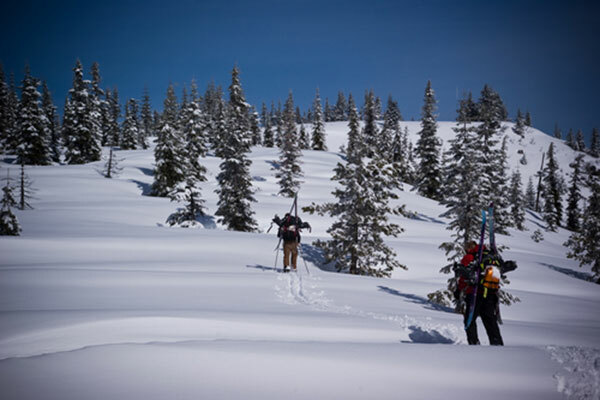 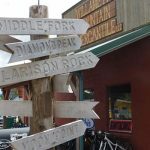 Indeed, we are less than an hour from Crescent Lake, the Waldo Lake Wilderness Area, and many fine mountain bike trails that offer excitement, challenge, relaxation, and gorgeous scenery. 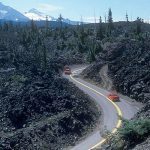 You want to take it easy, go on the nearby Aufderheide Scenic Drive. 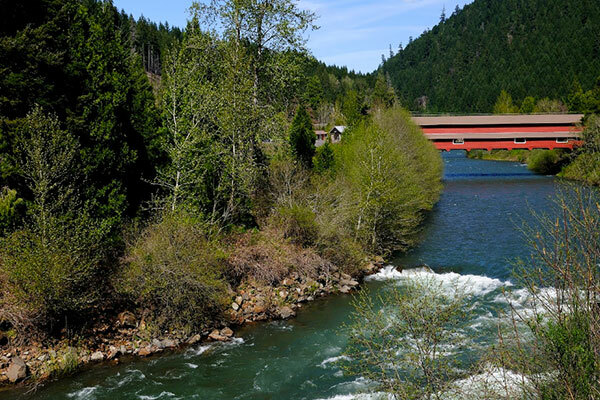 Hardly any traffic and paved, running along the river. 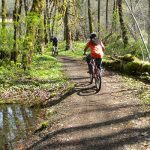 Or challenge yourself on the Larison Rock Trail (the trailhead is just a half mile down the road) or one of more than 20 local mountain biking trails in the Oakridge area Cascades. 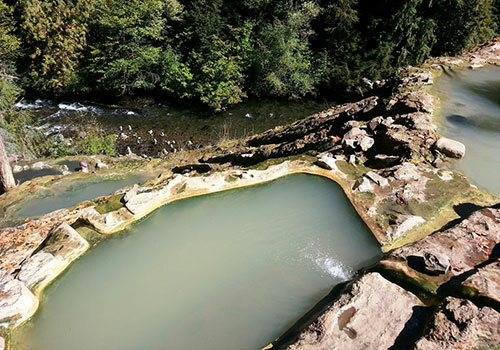 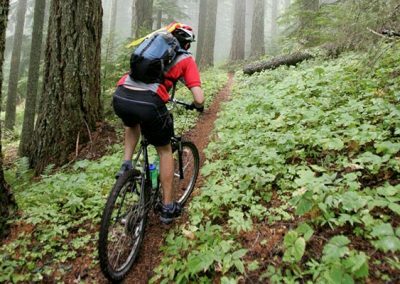 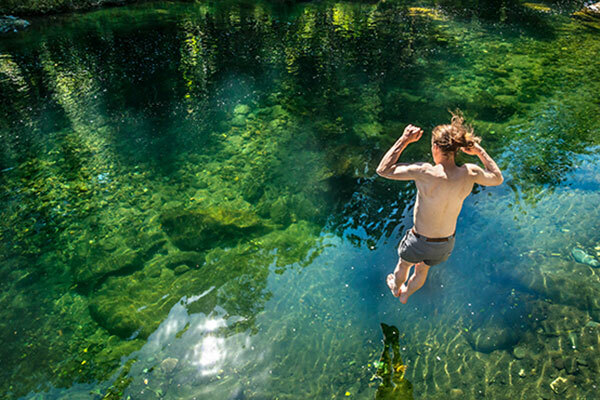 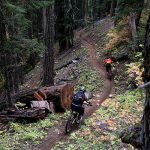 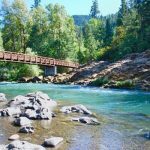 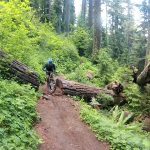 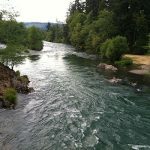 There are a great number of beautiful hiking trails in the Willamette National Forest, and generally, what is good for mountain bikers is good for hikers as well. 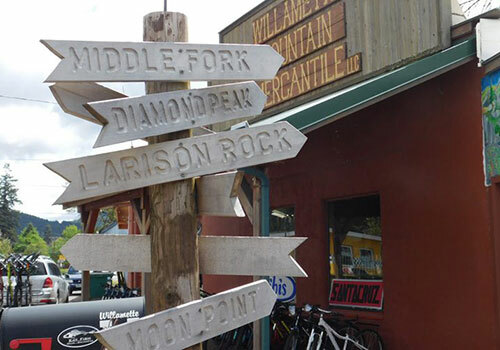 So we mention again the Larison Rock Trail just a half mile down the road from TDR. 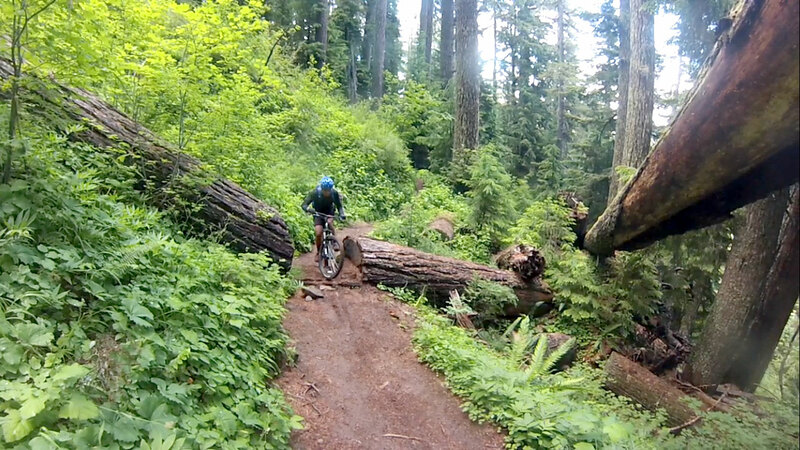 And there is a gated, old forest road in the other direction, not passable for cars, but great for hiking and mountain bikers too. 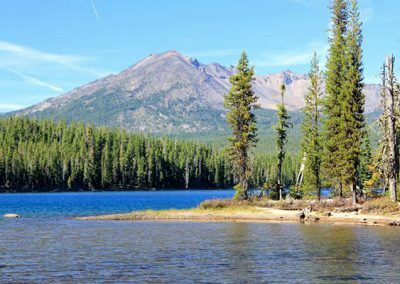 We are less than an hour away from Waldo Lake Wilderness Area, the Pacific Crest Trail is a few miles out of town, and our property has some trails that get you mingling with nature, big trees, sweet little creeks, and various fungi and plant life to stimulate the botonist or artist or? Trail riders enjoy the many non-motorized horse trails shared with mountain bikes and hikers in the Oakridge and Westfir area. 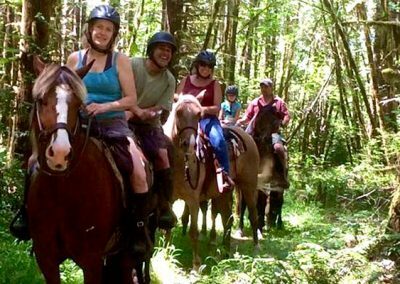 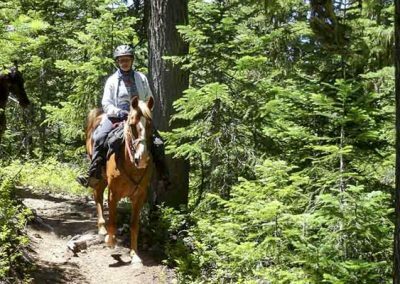 the horse trails range from easy to challenging, but all share the same common feature of the Willamette National Forest at its finest. 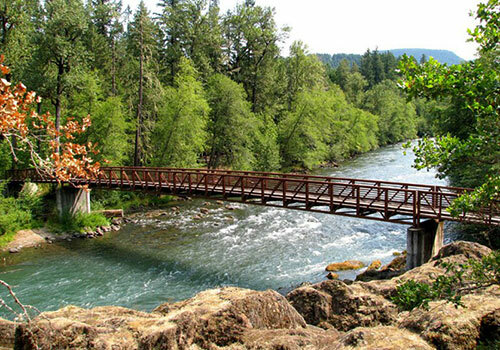 Breathtaking views, refreshing creeks, shady forests, occasional meadows, wildflowers. 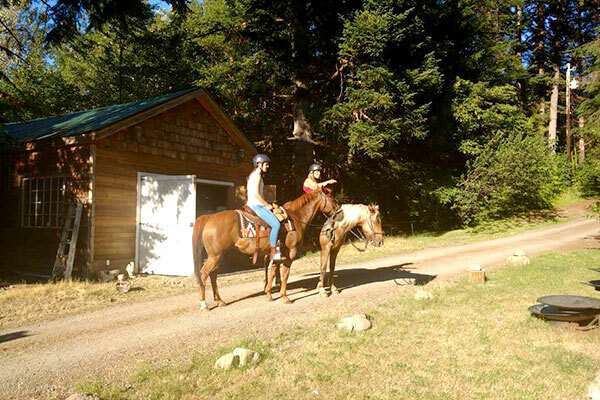 The best stuff for horses and riders alike. In fact, just a few steps into the forest from Tired Dog Ranch, we have our own horse trails to enjoy. 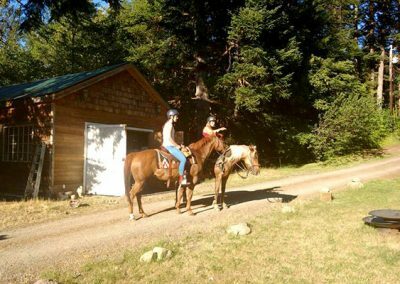 And of course, you can keep it simple by buying a bale of hay from us and having a secure, comfortable, and quiet place for you and your horse after a ride. 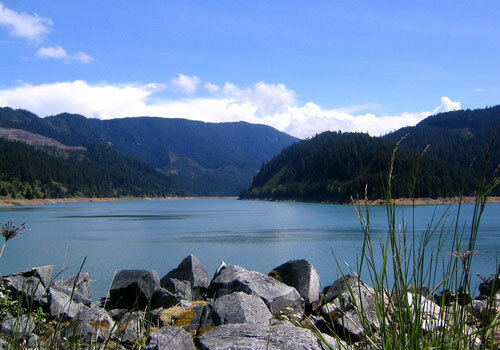 There are several opportunities for water related activities around Oakridge. 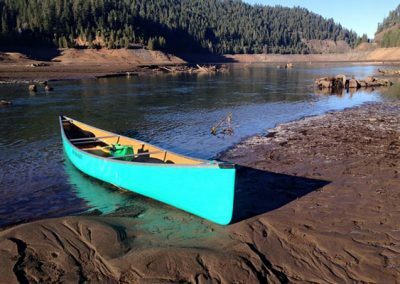 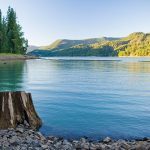 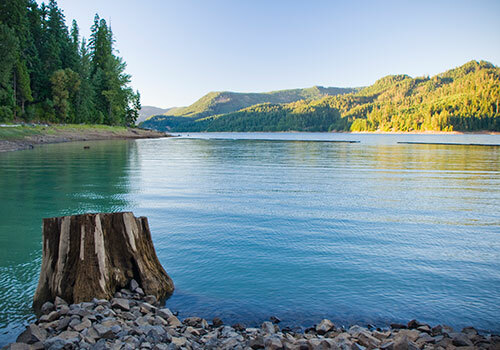 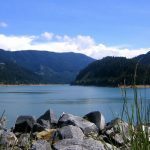 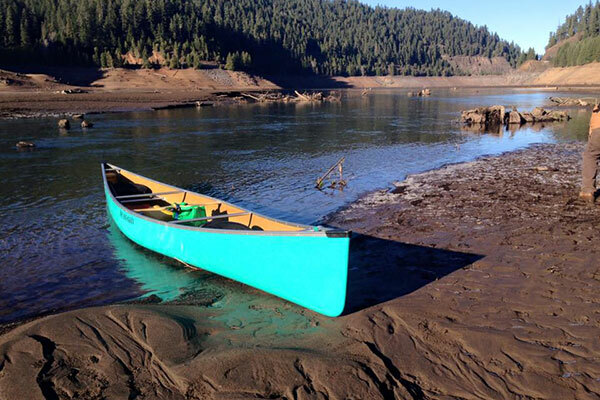 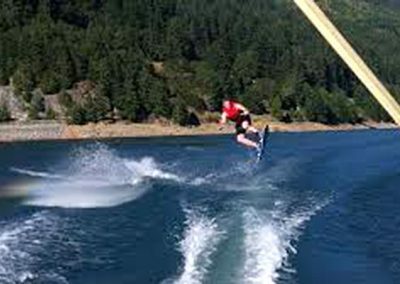 Boating is popular is the reservoirs, which includes kayaking, canoeing, sailboarding and sailing, and exciting whitewater trips down the Willamette River. 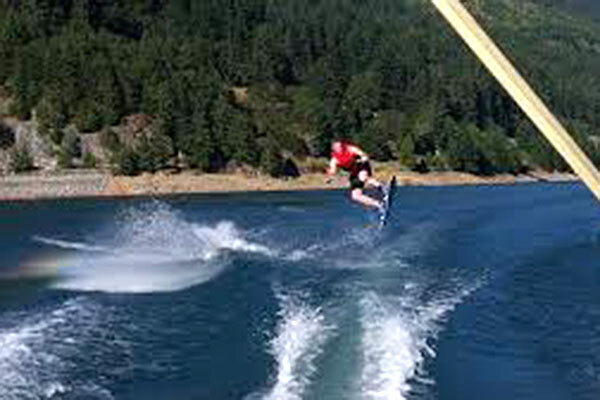 There is also waterskiiing, and motorized water sports. 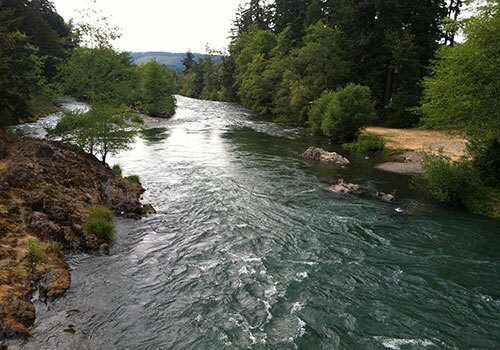 The Willamette and its many tributaries are famous for great fishing as well. 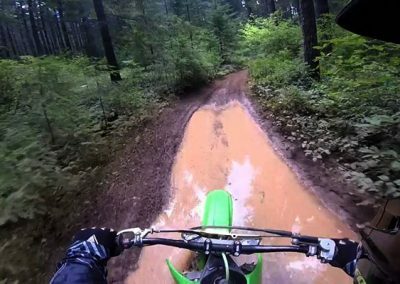 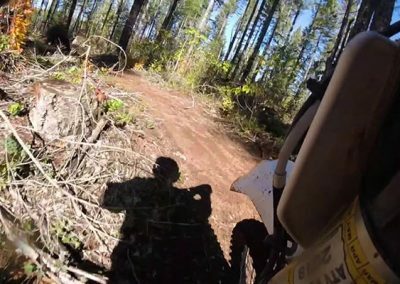 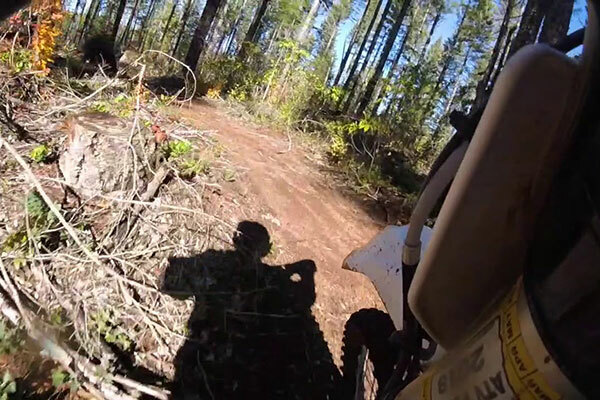 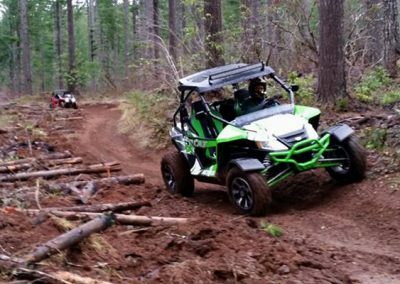 Just outside of Oakridge is a large portion of the Willamette National Forest devoted to motorized recreation, called Huckleberry Flats. 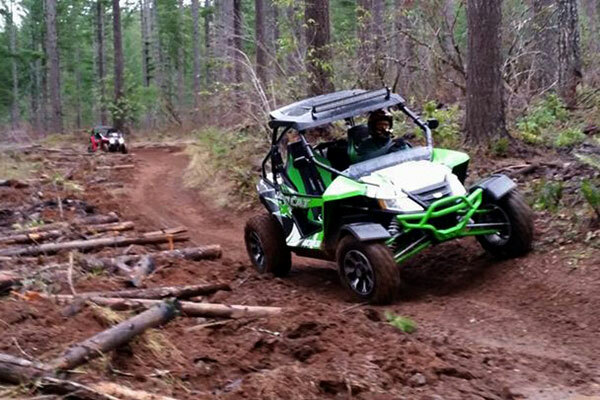 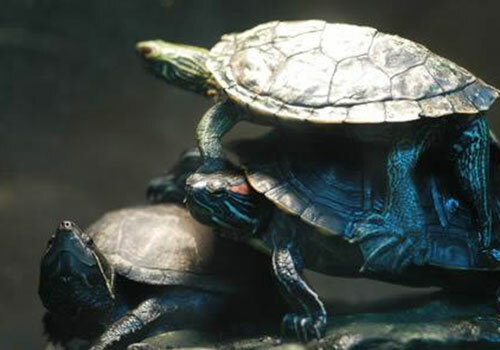 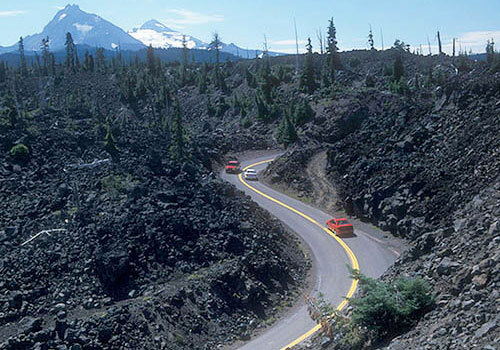 It is popular with motorcyclists, ATV riders, and other motorized recreation buffs. 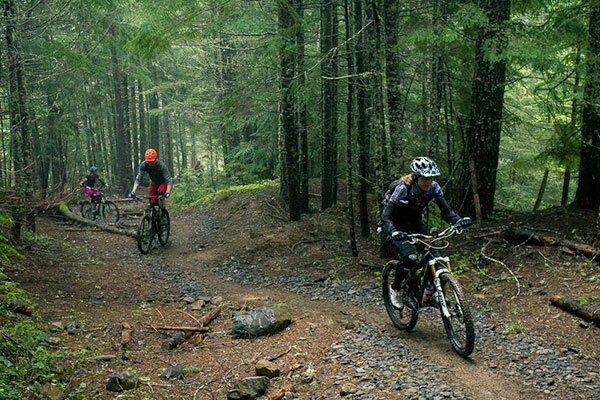 Huckleberry Flats makes sure that Its not just the mountain bikers that have all the fun, surrounded by towering trees and zipping along a network of well established trails through the woods, Huckleberry Flats is the place to have fun without worry. 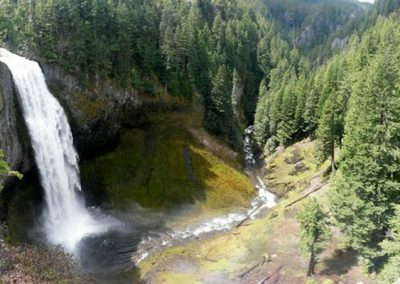 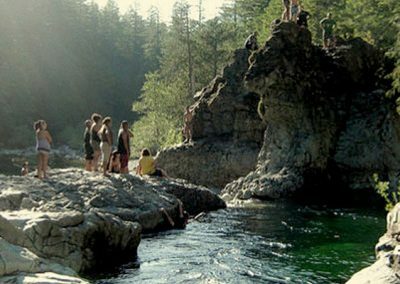 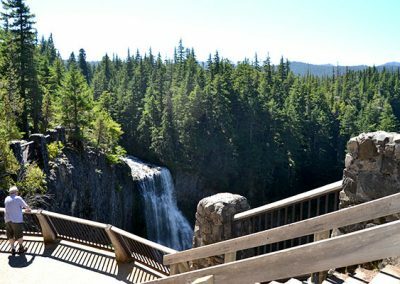 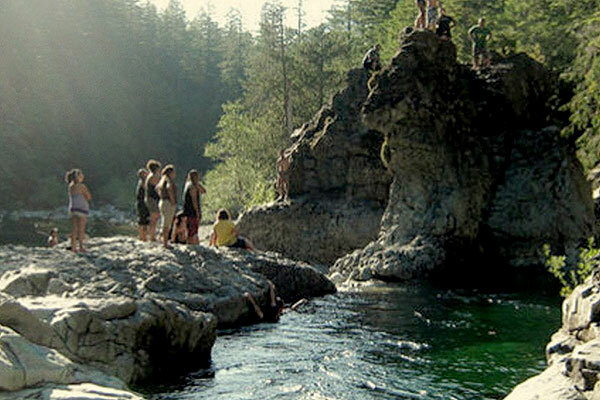 One of the most stunning attractions in the Oakridge area is the thundering and spectacular Salt Creek Falls. 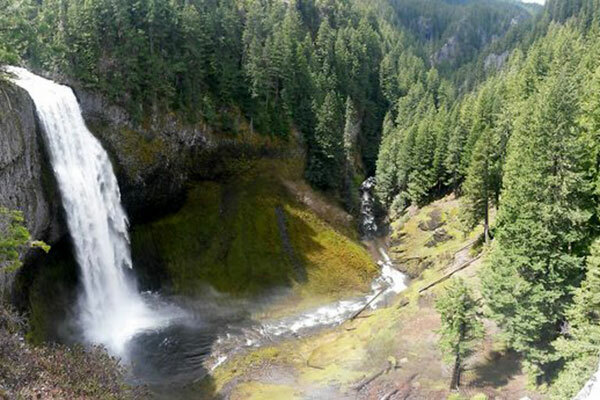 No picture we have seen does this waterfall justice. 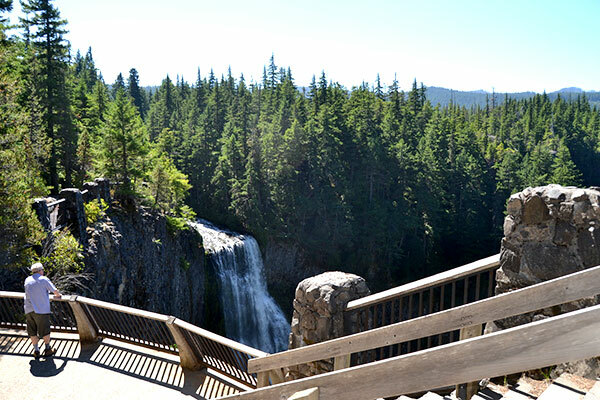 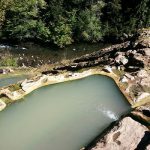 It is breathtaking and dramatic – the paved pathways take you to the very brink of the dropoff where you get dizzy looking down, and you can go to the bottom of the falls as well. 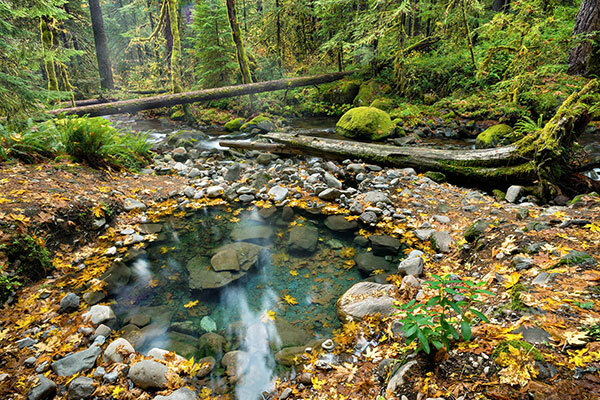 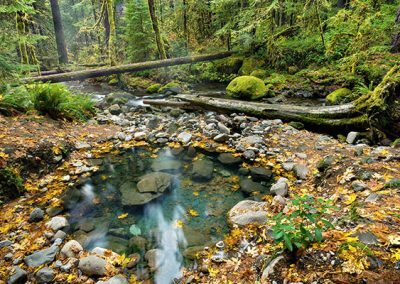 A “must see” of the Willamette Forest Oregon Cascades! 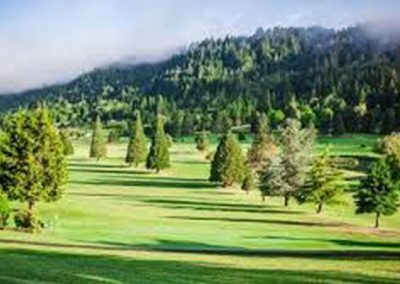 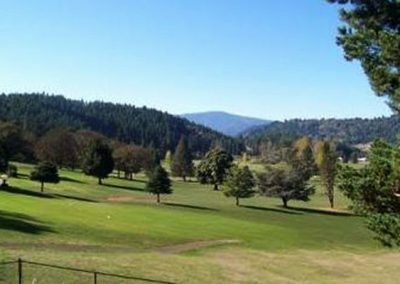 We have a 9 hole golf course in Oakridge-Westfir called the Circle Bar Golf Club. 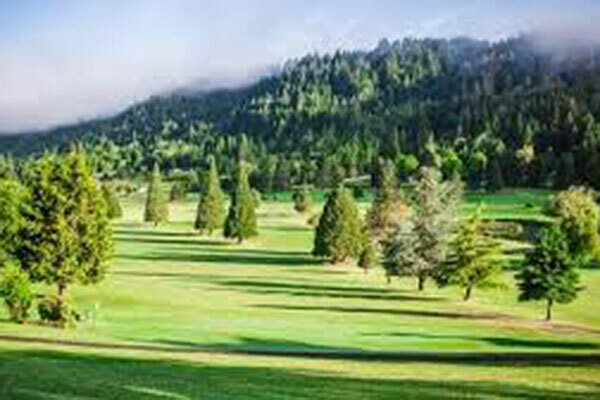 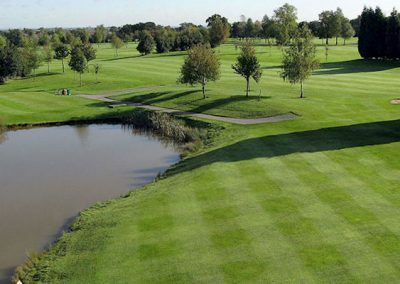 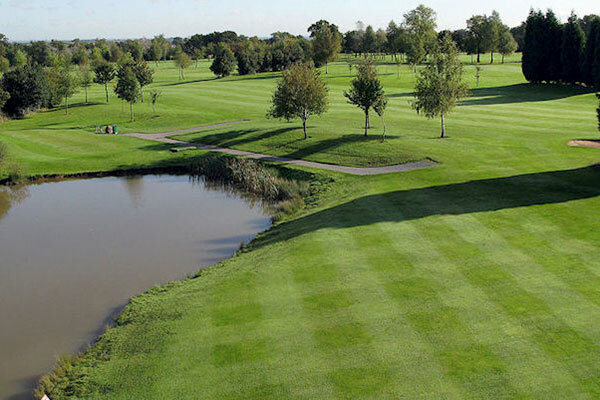 It is a non profit corporation to provide low-cost recreation to the area and has a lot of history you will find interesting – besides some good, challenging golfing that demands your best in accuracy for the 6648 yards. 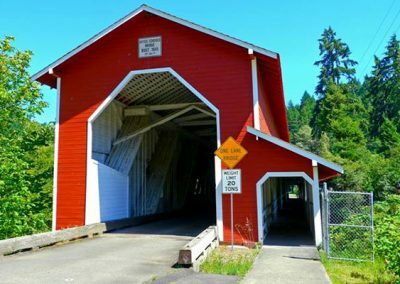 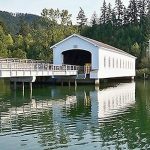 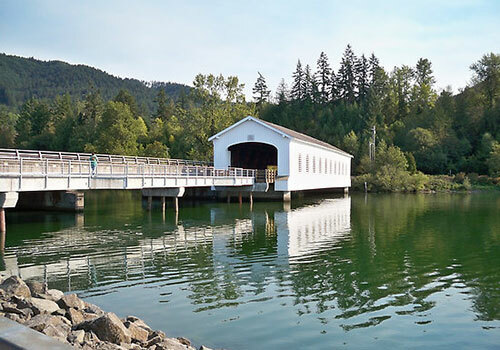 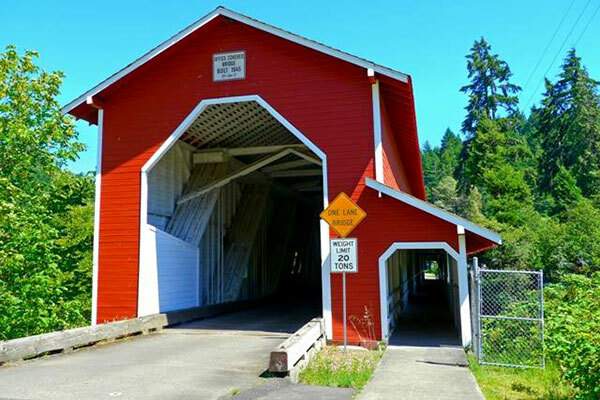 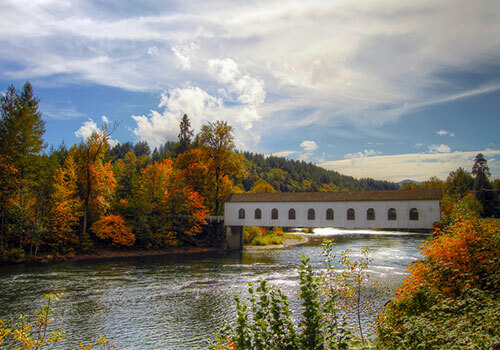 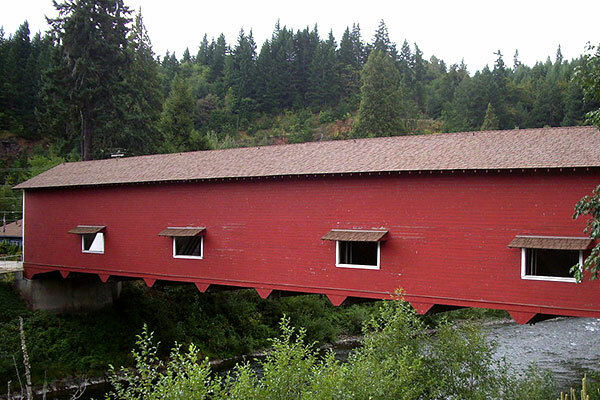 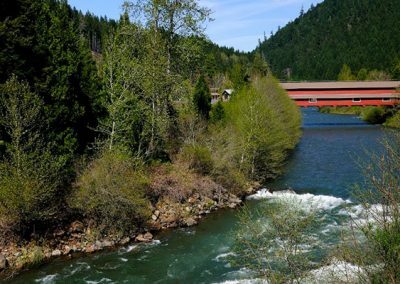 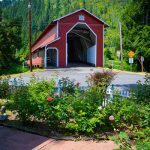 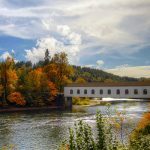 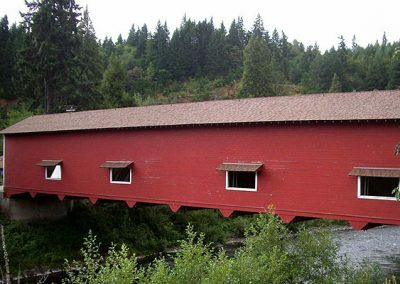 The Office Bridge At 180 feet in length, is the longest covered bridge in Oregon. 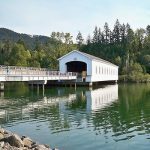 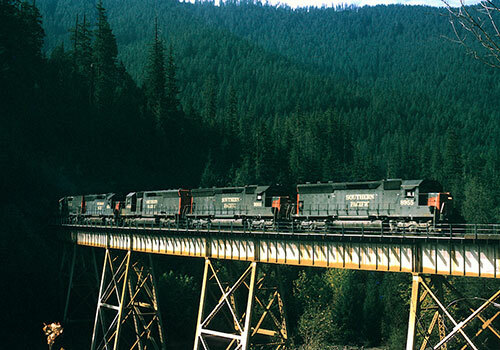 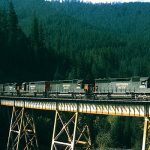 It was constructed by the Westfir Lumber Company using triple timber beams to provide the strength required to carry heavy logging trucks. 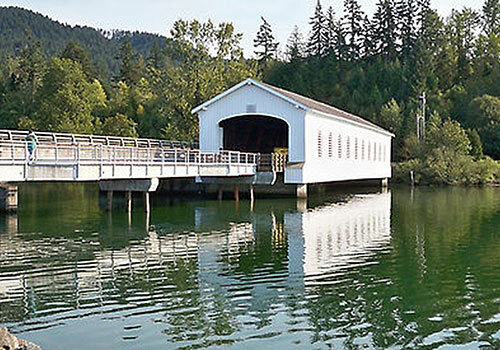 The bridge connects the lumber mill with the office (hence the name of the bridge). 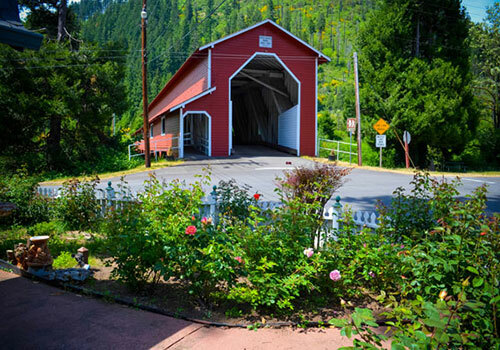 A lot of history and picturesque to boot. 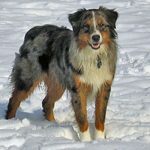 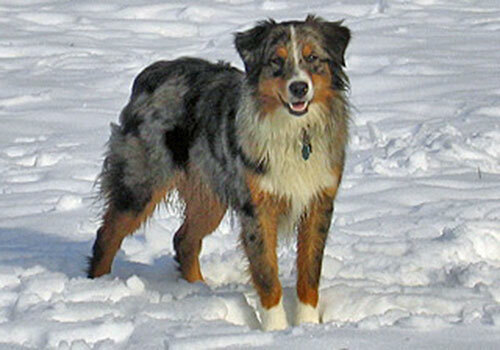 Tired Dog Ranch is great for skiiers, snowboarders, and snowmobilers. 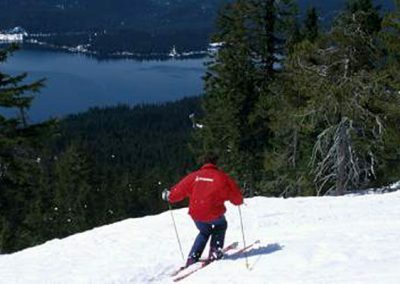 In less than an hour, you are where the snow rewards you with fine slopes at Willamette Pass. 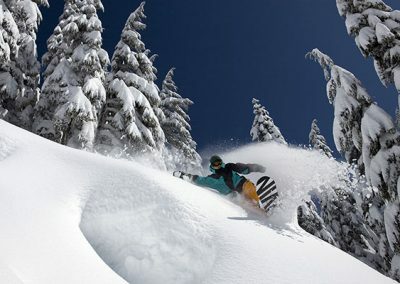 We also have various snow parks for sleds and disks nearby. 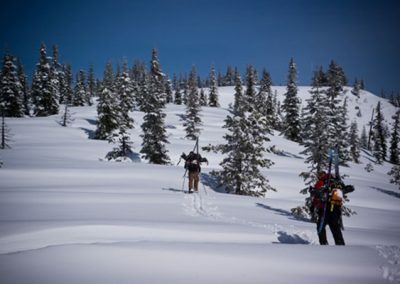 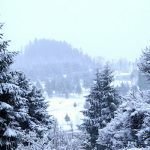 And if you snowmobile, ski, or snowboard, enjoy a welcome hot shower, cozy fire, and your own kitchen for that cup of cocoa or hot buttered rum, steaks, or whatever – followed by soft and warm down comforters and a good night’s sleep at Tired Dog Ranch.